Yosemite Guided Bus Tours are the best way to experience all the wonders that the park has to offer. Our expert tour guides will share their knowledge about this remarkable place, with tours that focus on natural history, indigenous peoples, the first non-indigenous settlers and wildlife. Whether you choose a bus tour or a walking tour, you’ll gain a deeper appreciation for all that Yosemite offers. PICK UP INSTRUCTIONS: Please retrieve your tickets from the Yosemite Valley Lodge Tour and Activity Desk at least 30 minutes prior to your tour departure time. We suggest allowing extra travel time to Yosemite Valley Lodge in the peak season due to possible traffic. The Tour and Activity Desk closes at 7 pm daily. Tours depart from Yosemite Valley Lodge. For bus & tram options, tour availability and reservation information, please view below. The full-day Yosemite Grand Tour combines Yosemite Valley, Glacier Point and the Mariposa Grove of Giant Sequoias for a memorable day in Yosemite National Park. Bring your camera for numerous photo opportunities! Click the "Check Rates" button in the upper-right hand corner of your browser to book tickets online or call 888.413.8869. In the park, reservations may be placed at any Tour & Activity Desk. Virtually every visitor who comes to Yosemite National Park spends at least some time at Glacier Point, drawn to the breathtaking views. On this four-hour tour, you’ll go from Yosemite Valley to Glacier Point—a 3,200-foot elevation gain. Be sure to bring your camera to capture awe-inspiring photos of Yosemite’s famous waterfalls and the distant High Sierra mountains. Availability Every day from late May to early November when Glacier Point Road is open - conditions permitting. Departure Location Glacier Point Tours meet at the lobby entrance of Yosemite Valley Lodge. If you are taking the park shuttle, get off at stop #8. If driving, please allow extra time for parking. Ticket Retrieval Tickets will need to be retrieved at the Yosemite Valley Lodge Tour and Activity Desk at least 15 minutes prior to your tour departure time. The Tour and Activity Desk is adjacent to the Front Desk in the main Lobby. Traffic and parking can be challenging in Yosemite Valley during the summer season, so we recommend allowing extra travel time as the tours leave promptly at the schedule time. Highlights El Capitan, Bridalveil Fall, Half Dome, Yosemite Falls in Yosemite Valley, Tunnel View, and Glacier Point. Additional Information Visitors can buy a one-way ticket and hike back to Yosemite Valley. You can pick up a trail map at the Half Dome Village Mountain Shop or the Glacier Point Store. Available year-round, the Yosemite Valley Floor Tour is approximately 2 hours long and can be enjoyed during the warm months in an open-air tram, and during the colder months from the comfort of a heated motor coach with panoramic windows. Led by park rangers and Yosemite Hospitality naturalists, you’ll get to see all of the highlights at Yosemite, as you learn about the history, flora, and fauna throughout the Park. Summer: 10:00 am, 11:00 am, 12:00 pm, 1:00 pm, 2:00 pm & 3:00 pm. Departure Location Tours depart daily from Yosemite Valley Lodge. Please call 209.372.1240 for exact times and current availability or visit any Tour and Activity Desk. Ticket Retrieval Tickets will need to be retrieved at the Yosemite Valley Lodge Tour and Activity Desk at least 15 minutes prior to your tour departure time. The Tour and Activity Desk is adjacent to the Front Desk in the main Lobby. Traffic and parking can be challenging in Yosemite Valley during the summer season, so we recommend allowing extra travel time as the tours leave promptly at the scheduled time. 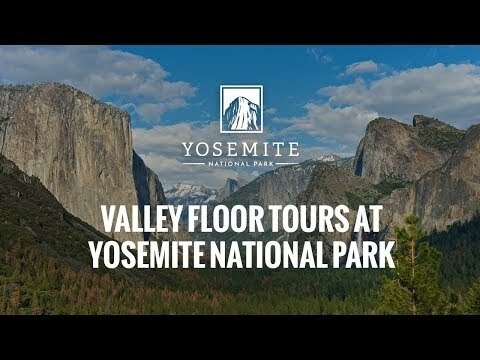 Highlights Yosemite Falls, Half Dome, El Capitan, Tunnel View, Bridalveil Fall and more. Additional Information The Valley Floor Tour is led by park rangers from approximately mid-April through mid-October when operating on open-air trams. During other times and wet or cold weather while it's tram season, tours are on buses and led by highly-knowledgeable drivers. For group rates, please call us at 888.339.3481. Departure Location Yosemite Valley Lodge, please call 209.372.1240 for current availability or visit any Tour and Activity Desk. Additional Information The open-air tram Moonlight Valley Floor Tour is led by Yosemite Hospitality interpretive naturalists. Highlights Hop on the Tuolumne Meadows Hikers Bus and leave the driving to us. Tuolumne Meadows is a favorite Yosemite destination during the summer and fall season. Gorgeous wildflower fields, outstanding views, and seemingly endless miles of trails. Request pick-up at The Majestic Yosemite Hotel when making your Tuolumne Meadows Hikers Bus reservation, please call 209.372.1240 in advance. Hikers Bus can be flagged for pick-up or drop off at any turnout large enough to accommodate the bus. 24 hour cancellation notice required to receive full refund. Cancelling within 24 hours of tour departure will forfeit full value.